• Distinguished DGs and MDs of Parastatals here present, distinguished ladies and gentlemen of the Press. • Many of you are aware that activity on the Nigerian Capital Market, particularly the stock exchange, has been very slow in the aftermath of the global financial meltdown and the Nigerian banking crisis. We saw the Nigerian Stock Exchange (NSE) All Share Index (ASI) plummet from a peak of about 66,000 points in March 2008 to less than 22,000 points by January 2009, wiping out over N8 trillion (or around 70 percent) of the total capitalization of the stock exchange within this period. Since then, activity on the stock market has remained sluggish even though there are some signs of recovery, with the index now at about 26,494 points thanks to the efforts of the NSE and the SEC. • A vibrant capital market is, of course, essential to the government’s Economic Transformation Agenda, especially in terms of raising much-needed long-term financing for critical infrastructure and the housing sector. Research (by the IMF and the World Bank) has shown that solid economic growth in any country is closely linked to the joint development of the banking sector and the capital markets. While the banking sector has already been cleaned-up, the capital market needs some intervention. • This is why, a couple of months ago, I set up a committee chaired by Dr. Kingsley Moghalu, Deputy Governor of the Central Bank of Nigeria, to make recommendations on measures to resuscitate the capital market. As part of the recommendations of the Moghalu committee, I am happy to announce today, two measures aimed at giving life to our capital markets. • Trading Restrictions: The brokers will be prohibited from taking proprietary positions or trade on their own account for one year. Let me also note that there were some other stock brokers who did not partake in any market infractions, including over-exposure to margin loans, and who managed their stock broking businesses well. The Ministry of Finance and the Central Bank plan to celebrate the good standing of these stock brokers in due course. • exempt from VAT, commissions: (a) earned on traded values of shares, (b) payable to the Securities and Exchange Commission (SEC), and (c) payable to the Nigerian Stock Exchange (NSE) and the Central Securities Clearing System (CSCS); by including these commissions in the list of VAT-exempt goods and services. Let me thank the Moghalu committee for their work, and also re-emphasize the government’s renewed commitment to making Nigeria’s capital market one of the most vibrant markets in the World. 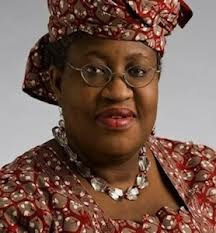 Labels: December 3, Ngozi Okonjo Iweala, Resuscitate capital market.